Concordia College students from the science and social work departments after their Opioid Addiction group presentation at West Acres Mall on Wednesday, November 15th. Pictured (left to right): Erin Host, Rebekah Nysetvold, Ashley Nyen, Ali Al Saegh, Cullen Knowles, and Amy Leopold. Photo by Sarah Herlihy. In 2016, the United States saw a 22% increase in opioid addiction. In 2014, opioid-related deaths in Minnesota had risen from 136 in 2004 to 319. And in 2016, there were 14 opioid-related deaths from January to July in Fargo-Moorhead. 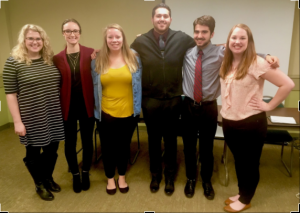 This information and more was presented by six Concordia College seniors for their Community Action Project titled ‘Know Science, No Stigma: Opioid Addiction’ in the West Acres Mall Community Room on Wednesday, Nov. 15. The project was completed in conjunction with Dr. Julie Mach’s neuroscience class and Dr. Laurie Dahley’s social work class. The criteria for the project included addressing social issues through education awareness, providing hypothetical aid programs, and demonstrating a collaborative approach. According to Mach, the goal of the project was very community-based. “[Students] find a community need and identify what [they] want to do to try and solve that need or provide something for the community,” she said. Past projects from the class have focused on the Concordia population, but this year’s group expanded their focus to address the entire Fargo-Moorhead area because of the current opioid epidemic. Senior biology major Cullen Knowles described his group’s objective. “Our end goal was to have a presentation that would raise awareness [about] not just the epidemic but about addiction itself … It’s not really a moral problem, it’s an actual disease of the brain,” he said. As part of their project, the group posted flyers throughout the community in hopes of reaching a diverse population. The approximate 20 attendees at the event were given a survey to fill out before and after the presentation. In addition to those attending in-person, 18 people viewed the presentation via Facebook Live. “We basically just asked, ‘How well did you think you knew opioid addiction before you came to the presentation?’ And after, ‘How educated are you about it now?’ We just wanted to see if the people who attended the presentation actually felt like they got something out of it,” Knowles said. The lecture began with an explanation of the project’s purpose, science and statistics, and a segment from Blue Cross Blue Shield’s recent documentary on opioid addiction. Knowles summarized the science portion in the presentation, explaining that opioids trigger a release of dopamine when they enter the brain, activating the rewards system. Taking opioids repeatedly causes the strengthening of some connections in the brain and weakens others. “Addicts don’t crave their drug of choice because they want to or because they decide to but because the rewards system of their brain basically motivates them to take the drug,” Knowles said. For the second half of the presentation, a panel was called up for question and answer time. The panel consisted of Joe Moran, a recovering opioid addict; Elaina Winn, a senior social work major at Concordia whose family has been affected by addiction; and Concordia’s Dr. Susan Larson, professor of psychology, women’s and gender studies, and neuroscience. All three panel members offered insight into the opioid epidemic. Moran shared his life experience with the audience. “It’s a disease … it’s a part of me but it doesn’t define who I am,” he said. Winn shared similar thoughts on the issue. “Someone may be an addict, but that is not all that they are,” she said. One popular topic of discussion was harm reduction, a strategy aimed at reducing the negative consequences of drug use. Harm reduction involves incorporates a series of steps from safer use, to managed use to complete abstinence. Larson agreed with the idea. Moran agreed with the concept of harm reduction as well. One of the ways harm reduction is currently being implemented in the Fargo-Moorhead area is needle exchange through the Good Neighbor Project. Jeremy Kelly, creator and owner, runs a needle exchange program in town, setting up locations and times for drug users to safely drop-off their used needles in exchange for new ones. This stigma is exactly what the students were trying to educate the public on. “Simply understanding that addiction is a mental illness and not a moral weakness or choice is very important. A lot of people believe that addiction is just a choice and that it is not the case. They are affected mentally,” one student presenter said. “Thinking about addiction as a brain disease has helped us remove some of that stigma,” Larson said. Reducing this stigma means that addiction is less likely to be perceived as a moral failure. The presentation’s success will be measured not only by how many people attended the event, but also how much those who attended knew about the opioid addiction after the presentation, which will be analyzed in the next week. The class project, which currently satisfies a capstone requirement and will continue to fulfill PEAK requirements for students moving forward, will hopefully continue its collaboration.